Trying to figure out how much aluminum fence you need? Are you confused with all the different posts, and accessories that are involved with buying an aluminum fence? No problem, just follow the directions below to help you make your choices. 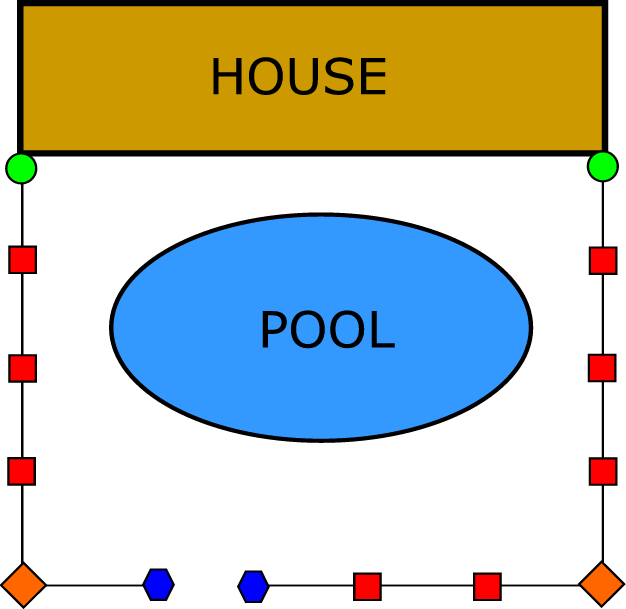 This is a sample line drawing of a back yard with a pool. This drawing is only a sample, but you can use it for reference when working out what you need for your fence. Now try making your own sketch. 1. Create a sketch in pencil (so you can easily make changes) of the general layout of the fence. Now take precise measurements of each side of the fence. Keep in mind, Jerith aluminum fence comes is 6’ wide pre-assembled sections. 2. Now establish the number of sections; keep in mind that if you require a section that is less than 6', this will require the section to be cut down. Example: 21' line of fence will require 4 sections (4 sections x 6' wide = 24', 3' must be cut down to accommodate installation). 3. Now establish the number of posts needed. 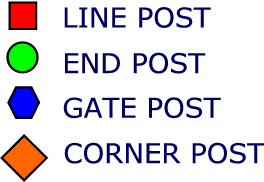 Remember to include all the line posts, end posts, gate posts, and corner posts. Still cant figure it out? NO PROBLEM, just fax it over and we will tell you want you need, now that's service. Just send a fax to 330.650.9004 with your name, phone number, style and height of fence, as well as you zip code so we can work out shipping. Then we will fax you back a quote.